I like using MAC computers because of the inherent stability of the underlying UNIX operating system, and the immunity to most viruses. One disadvantage, however, is that not all types of programs are written for the MAC. I occasionally have need for an antenna modeling program. On my windows PC, I used EZNEC (http://www.eznec.com) which costs about $100. I have always wished to have a similar program for the MAC. I have now found an even better program than EZNEC, that is written specifically for the MAC. The program is “cocoaNEC” (http://www.w7ay.net/site/Applications/cocoaNEC/) written by Kok Chen a retired Apple software engineer. The program will run on OS X 10.6 or later, I have been running mine on the latest MAC operating system OS X 10.10, Yosemite, with no problems. This elegant and fast running program is written in OS X’s native programming language. This program takes advantage of all the cores of a modern Intel processor, therefore, it runs fast. The best part, however, is that the program is free. The downloaded program includes a reference manual and tutorial. Example antenna files can also be downloaded from Kok’s webpage. “cocoaNEC” uses the NEC-2 computational engine. NEC (Numerical Electromagnics Code) was developed by Lawrence Livermore Laboratories in 1981 to simulate the electromagnetic response of antennas and other metal structures. The antenna characteristics can be input in either one of two ways, via a tabular spreadsheet interface or a special NC programing language interface. The spreadsheet approach is simpler, however, the NC programing interface is more powerful. The antenna’s input information consists of its geometry (for a conductor, the x, y, z coordinates of its endpoints), its excitation, and type of ground (if any). The summary output for a three-element Yagi antenna located 10-meters above the ground is shown below. The different color lines represent different frequencies. The antenna can be modeled in free space or above a conducting ground, and the ground conductivity can be varied. 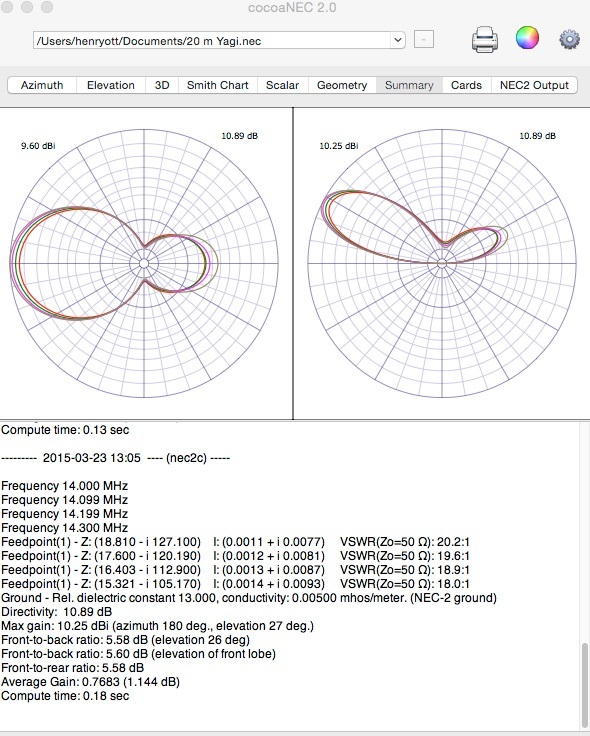 Other outputs consist of a 3-dimensional radiation pattern, driving point impedance and VSWR, as well as a physical plot of the antenna’s geometrical structure. Currents in the various conductors making up the antenna elements can also be plotted, as well as a complete tabulation of the NEC engine output. If you are a MAC user and have the need to do some antenna modeling, give cocoaNEC a try, I think that you will like it. This entry was posted on March 23, 2015 at 4:12 pm and is filed under Antennas. You can subscribe via RSS 2.0 feed to this post's comments. Very cool, Henry! I’ll give it a try. I think that you will like it Ken. Let me know your comments. Yes. That is what I am presently running it on. I use cocoaNEC 2.0 and it works great with a punctual excitation point like dipoles based design. But I cannot succeed in modeling a J pole. I think the issue in defining the excitation element.